Click for a gallery of images by photographer and Asa Wright Nature Centre guide Harold Diaz. 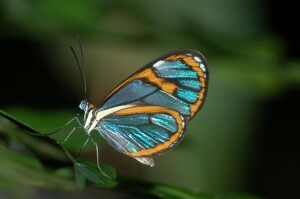 The continental origin and proximity of Trinidad to South America, along with its varied habitats, has resulted in an extremely diverse biota. Species lists for this island are impressive, including 97 native mammals, 400 birds, 55 reptiles, 25 amphibians, and 617 butterflies, as well as over 2,200 species of flowering plants. No other area in the West Indies, and few areas of comparable size in tropical America, can match this spectacular species diversity. Trinidad is 50 miles long by about 37 miles wide, and dominated by the Northern Range, which rises to about 3,000 feet and was historically covered by tropical rainforest. Here, in this lush part of this beautiful island, you will find the magical Asa Wright Nature Centre. To see Squirrel Cuckoos, Toucans, and parrots fly past the gallery, while Tufted Coquettes and half a dozen other species of hummingbirds feed on the vervain by the Reception, is but a small part of what the birder will find at the Centre. Botanists and entomologists and other naturalists will find the area equally rich. Located at 1,200 feet in the mountains of the Northern Range, seven miles north of the town of Arima, the Asa Wright Nature Centre (AWNC) is a world-class natural history destination for students of tropical ecology and is of particular interest to birdwatchers. The AWNC is a “Not-for-Profit” Trust established in 1967, by a group of naturalists and bird-watchers to “protect part of the Arima Valley in a natural state and to create a conservation and study area for the protection of wildlife and for the enjoyment of all.” It was one of the first nature centres to be established in the Caribbean. Comprising nearly 1,500 acres of mainly forested land in the Arima and Aripo Valleys of the Northern Range, the AWNC’s properties will be retained under forest cover in perpetuity, to protect the community watershed and provide important wildlife habitat. The Centre’s main facilities are located on a former cocoa-coffee-citrus plantation, previously known as the Spring Hill Estate. This estate has now been partly reclaimed by secondary forest, surrounded by impressive rainforest, where some original climax forest on the steeper slopes have a canopy of 100-150 feet. The whole effect is one of being deep in tropical rainforest. A special attraction on the property is a breeding colony of the nocturnal Oilbird, or Guacharo (Steatornis caripensis). Located in Dunston Cave, a beautiful riparian grotto, it is perhaps the most easily accessible colony known for this remarkable species. Indeed, the World Wildlife Fund made a substantial contribution toward the establishment of the Centre in order to protect the colony. Under talented professional leadership from its volunteer international- and locally-based board of management, the AWNC has developed its efforts in three major areas: Education, Conservation, and Ecotourism. It is now widely recognized as one of the most successful ecotourism stories in the world. Since its inception 50 years ago, the AWNC has been a leader in ecotourism — long before that word was even coined. It remains a world-class leader in this field, unsurpassed not only in Trinidad & Tobago but across the Caribbean, and is a world-renowned nature destination.